GIPHY for vB5 - vBulletin Mods That Rock! 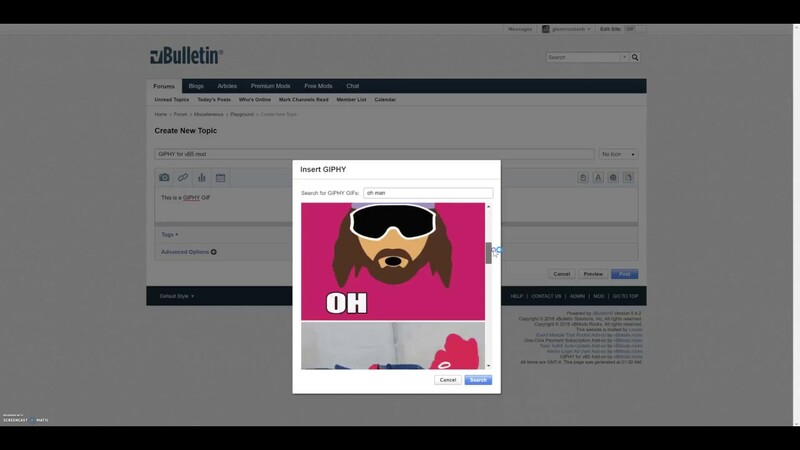 Make your vBulletin forum conversations alive and fun by allowing users to quickly insert animated GIFs from GIPHY.com, the top online source for the best and newest animated GIFs. No more combing the internet to find the right GIF to post and then hoping it has code to embed using [img] BB Code. No more saving GIFs to the desktop and then uploading them manually to your posts. Now you can have complete access to GIPHY’s wide catalog of GIFs directly from your forum. vBulletin 5 forum conversations have never been this much fun with this GIPHY mod! Integrated with GIPHY Search API. Search for GIFs right within the vB editor. Infinite or continuous scrolling to load the next set of GIFs until there no more GIFs to show. Images are not uploaded to your server but are hosted externally by GIPHY.com and embedded into the posts. So no need to worry about server storage capacity issues. No template edits required. Just upload the product XML file and the GIPHY script and images to your server. Uses Style Variables for some of the styles used. For example, to use a different GIPHY attribution icon for Dark themes, you'd simply change the image path in a style variable. Or to change text color for GIPHY-generated error messages, then you'd also change it in a style variable. Uses Phrase system. You can translate the phrases used in the mod. Can specify which usergroups can use this GIPHY feature. This mod requires a GIPHY Developer account and GIPHY API key. Sign up for a free account at https://developers.giphy.com and then create an app to obtain an APi key. NOTE: This is not compatible with vBCloud as it does not allow installing product XML and uploading 3rd-party scripts to the server. Last edited by glennrocksvb; 09-25-2018, 04:56 PM. I've installed this GIPHY mod here for beta testing. Please try it and provide any feedback. Please post your GIF reaction here about this mod. I will start. Last edited by glennrocksvb; 09-17-2018, 02:51 PM. It's a known issue that pressing Enter after typing a search keyword doesn't submit the form. I'm working on that. That feeling you get when Glenn solves your problem! That baby's reaction is priceless! Last edited by glennrocksvb; 09-18-2018, 01:24 AM. You can now press Enter key after typing a search term to submit the search. I've also made other tweaks. It's a small thing, but the GIPHY icon on the top right side of the editor is not as sharp as the other icons. Thanks for the feedback. I will look into changing that. I have updated the GIPHY icon and taken it from their website. It's better but it's still not as sharp as the other icons. It's because GIPHY icon is using pixelated style. You may need to clear your browser cache or do a hard reload to get the new icon. When will this be ready for purchase?